Gretchen Koehler teaches the tune FIRST CRUSH. This month I am featuring the tune First Crush. I composed it after a light hearted, ego boosting day. (Which I'll admit, I find slightly embarrassing!) Melodies I write tend to come from a place of quiet contemplation such as Sky Top (waltz), but not this tune. I'd describe it as a New England contra dance reel where a "down the hall" would be done with some swagger. I had just picked up my son Sylvain from school when, by chance, an interview I had recorded about an upcoming concert aired on the radio. Syl was in the back seat gasping "That's YOU, mom! Mom. Mom. You're famous. Mom, are you famous?" It was so sweet. The interview was conducted by my old pal (and fiddle student! ), Joel Hurd and we were discussing the music of my new friend from NYC, jazz pianist/composer Daniel Kelly and my role in his concert. I drove around town for a few minutes so we could keep listening. We stopped at the red light next to First Crush Bistro/Wine Bar and I casually glanced over at the marquee on the sandstone building. I did a double take as I was met by my own face smiling back at me on the newly posted sign. This marquee generally features touring artists (thus Daniel's concert), so local musicians rarely make an appearance. I had Syl snap a picture and sent it to Daniel teasing that his performances at Lincoln Center were small taters compared to this ad on the "First Crush Corner." My son's precious reaction continued to feed my ego all the way home. I wrote this reel in three part harmony and dedicated it to the three guys who made me smile that day; Joel, Daniel and Syl. 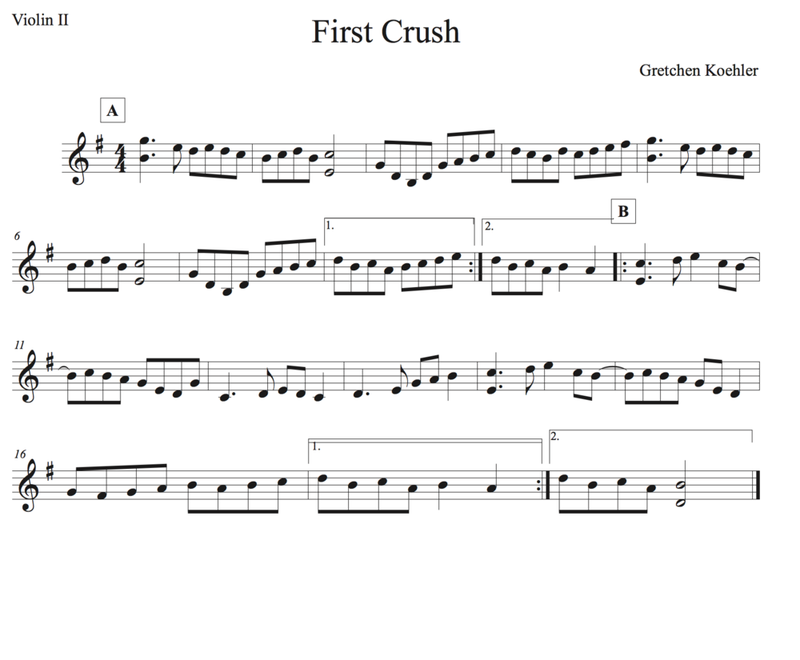 Koehler & Kelly recorded First Crush (The Waxwing/2015) and we included a track of my son step dancing that was recorded by none other than Joel. As I think about it, I was literally able to capture all of them all in a tune!